NRG Canny Belters are crowned Northern Champs! This weekend, Newcastle Roller Girls’ Canny Belters became northern champs, taking the top spot in the T2 North British Roller Derby Championships. Both teams were unbeaten going into the final, and Nottingham’s Hellfire Harlots put up a good fight, taking an early lead and holding NRG to a single point for several jams in a penalty-heavy first ten minutes. NRG came back to end the first half ahead with 107 points to Nottingham’s 89, but there were another two lead changes and some tense moments in the second half before the Belters were able to pull away and extend their lead. The final score was Newcastle Roller Girls 194 to 137 Nottingham Hellfire Harlots. Leeds Roller Dolls came third place after winning their game in a local derby against Hot Wheel Roller Derby, with Manchester Roller Derby and Hulls Angels Roller Dames placing 5th and 6th in the table respectively after their bout. Newcastle Roller Girls will now play the South division winners, London Rockin’ Rollers and the Harlots will play Royal Windsor for two places in the premier division next season – joining Glasgow Roller Derby, Edinburgh’s Auld Reekie Roller Girls, Cardiff’s Tiger Bay Brawlers and Middlesborough Milk Rollers (the top 4 ranked teams in the UKRDA). 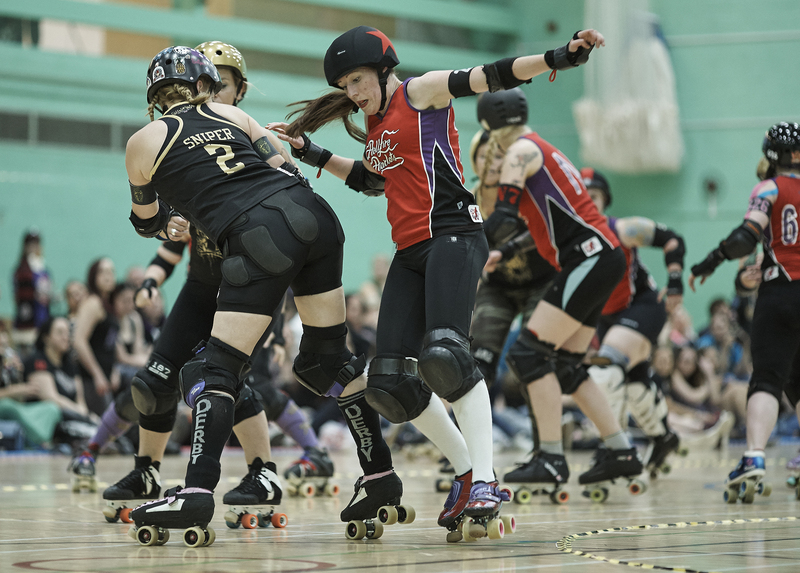 Catch Newcastle Roller Girls in action in our next home bout on Saturday 5 September at the Walker Dome when the Canny Belters play Swansea and the Whippin’ Hinnies play Leicestershire’s Dolly Rockit Rollers. Advance tickets are on sale now. Previous PostBelters take silver at SKOD – A Skate OdysseyNext PostWe’re off to British Champs playoffs!